It is a direct Patent Infringement case, claimant “Data card Corporation” (Datacard) sued Eagle technologies for infringing its couple of patents: UK 1458572 (‘572) and UK 1534530 (‘530) and also couple of trademarks: UK 1399698 (‘698) and UK 1399699 (‘699). When I was searching case laws to understand the degree of obviousness, especially in the field of mechanical engineering, from English courts I came across this wonderful case and hence thought of blogging on the same. In Part – I, I have decided to pen down the insight arguments between the claimant and the defendant and also to summarize the judgment for the ‘530 Patent. Although, Eagle accepts the infringement of its products, it questions the validity of the “530 patent. The case principally involves thermal transfer printing. The ‘530 patent entitled “Supply items for printers and the like, and method of loading supply items” has a priority date of 31st July 2002. The invention relates to printers, laminators and other equipment to produce data bearing identification. In particular, the invention relates to supply items (Ribbon, webs that carry laminate patches, cleaning tape, holographic overlays, and other exhaustible web materials) in such equipment and to a method for facilitating the loading of the supply item into the equipment. 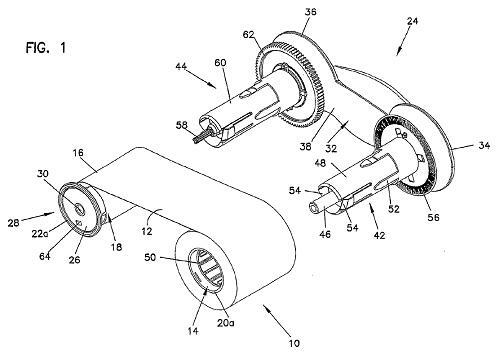 The patent describes a supply item and a carrier that are modified to facilitate loading of the supply item onto the carrier in the proper orientation, and the carrier can be more easily loaded into the production equipment in the correct orientation. The supply item 10 includes a print ribbon 12 wound onto a supply cylinder 14. The supply cylinder 14 includes first and second ends 20a, 20b and is generally hollow from the first end to the second end. Likewise, the take-up cylinder 18 includes first and second ends 22a, 22b and is generally hollow from the first end to the second end. Preferably, the ends 20a, 20b, 22a, 22b of the cylinders 14, 18 are designed to facilitate loading of the cylinders 14, 18 onto a carrier 24 in the proper orientation, thereby simplifying ribbon replacement. Mostly a difference in the geometry of the ends of the cylinders 14, 18 is used to achieve the simplified replacement. With reference to Figures 1, the ends 20a, 20b of the cylinder 14 each define an opening having an area, with the area of the opening at the end 20a being substantially equal to the area of the opening at the end 20b. In addition, the ends 22a, 22b of the cylinder 18 each define an opening having an area. However, the end 22a of the cylinder 18 is closed by a wall 26 that forms part of a cap 28 that is connected to the end 22 of the cylinder 18. An opening 30 is provided in the wall 26. Thus, the area of the opening 30 at the end 22a is different than the area of the opening at the end 22b, and the area of the opening 30 is different than the area of the opening at the end 20a of the cylinder 14. The difference in the geometry of the openings at the ends 20a, 22a of the cylinders 14, 18 limit how the cylinders 14, 18 can be connected to the carrier 24. While the end of the cylinder 18 is described as having an opening 30 with an area less than the opening at the end of the cylinder 14, it is to be realized that the reduced area opening can be provided on the cylinder 14 rather than on the cylinder 18. The inventive concept of claim 1, after amendment, explains that one end of one of the cylinders of a supply item has a different geometry to that of the other three ends so that the supply item can be correctly loaded onto a carrier having appropriately-shaped spindles. The Fargo Pro-L printer has four hubs, three of which are large and one of which is smaller. The ribbon is supplied on two cylinders. One of the ends of the cylinders is different to the other three ends in that it is fitted with a closely fitting circular insert. This insert has an aperture which is concentric with the circumference of the insert and the inner circumference of the cylinder. The insert contains a number of metal pins disposed in a circle concentric with the aperture. The aperture enables the end of the cylinder with the insert to fit onto the smaller of the four hubs, but is not large enough to fit properly onto the other three hubs. The differences are that, in Fargo Pro-L the cylinders are directly loaded onto hubs in the printer. On the other hand, in amended claim 1 of ‘530 the cylinders are loadable onto spindles on a carrier, the cylinders have ribs on their interior surfaces and the differences in the ends of the cylinder are capable of limiting how the cylinders can be connected to a carrier. Eagle contends that there is a disadvantage with the method of loading the ribbon used in the Fargo Pro-L as it was fiddly to fit the cylinders onto the four hubs inside the printer. A well-known and obvious alternative method of loading a ribbon in 2002 was direct loading onto two spindles in the printer. Once the skilled team decided to adopt the direct loading onto spindles approach, it would have been immediately apparent to them that the cylinders would need to have ribs on the inside so as to enable the spindles to drive the cylinders. At that point they would have arrived at a supply item within amended claim 1, because the geometry of the ends of the cylinders would be capable of limiting loading onto spindles on an appropriate carrier. First, DataCard argues that the skilled team would have no motive to change from the hub design of the Fargo Pro-L. Judge did not accept this arg. and said that the absence of motive is not conclusive Changing from one well-known ribbon loading arrangement to another one is not something that requires a specific motive, because they are technically obvious alternatives to each other. Furthermore, in the present case there would be a motive, namely the desire for a less fiddly method of loading the ribbon. Second, the skilled team would have motive not to change it. Judge refused this arg. and said by changing the loading method from hubs to spindles would not necessitate changing the insert, nor prevent the ribbon being identified by means of a Hall Effect sensor. Third, if the skilled team decided to change from hubs to spindles, it would be into a complete re-design of at least the ribbon-loading aspects of the machine. Judge refused this point by saying if differential geometry of the ends of the cylinders in terms of preventing error loading when combined with suitable hubs would be apparent to the skilled team, then it would not take invention to appreciate that precisely the same advantage could be obtained when replacing hubs driven by means of notches with spindles driven by ribs. Fourth, judge, for the above reasons, refused to accept Expert witness evidence that the two systems involved a different constructional principle, and therefore a wholesale re-design would be required. Finally, DataCard submitted that account should be taken of Expert Witnesses evidence in his reports as well as his evidence in cross-examination. Although Judge have taken Witnesses evidence and its reports into account, this does not assist DataCard for the simple reason that in his reports Expert Mr Klinefelter did not consider the case which was put to him in cross-examination. Judge is of the opinion that the arguments in relation to Brother are similar to those in relation to Fargo Pro-L. So far as amended claim 1 is concerned, Eagle’s case is that an obvious alternative to the different notches on the spools in Brother would be to drive the cylinders by means of ribs inside and to change the geometry of one end in a different way by making one of the apertures of the cylinders smaller than the others. Judge agreed to Eagles argument. Sharp is a similar proposal to Brother. Counsel for Eagle accepted that Eagle’s case in relation to Sharp was virtually identical to its case in relation to Brother. It is seen that the case laws, for obviousness, interpret the evidence and the prior arts from the person who is skilled in the technology. From his point of view Judge questions the Expert witnesses of both the parties. Infact Judge questions the witnesses as to whether the prior art leads a motive to develop to the present patent in question? Whether, skilled team can arrive only to this technology as an alternative to the existing technology in the prior art? and so on. There are certain differences in the degree of obviousness from US courts and English courts point of view. Graham factors, the core factors for finding the obviousness include many factors and are very rigid in nature. In the next part, we will see the obviousness case of ‘572 patent to assess the degree of obviousness in the UK courts in a detailed manner. A patent is referred to a set of rights granted to an individual or business by the state that gives them public disclosure of a new invention for a specific amount of time. This grant does not actually give the holder the exclusive right to practice the invention, but simply the right to preclude other outside parties from using or imitating it. Patent Litigation is a controversy or disagreement between two independent parties regarding a dispute of intellectual or physical property.